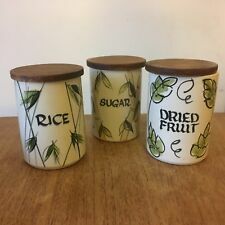 (You will recieve all 3 kitchen pantry / storage jars :-). It is Millennium B.C rebuilding of gray baked at 850 degree centigrade and turquoise mucilage at 950 degree centigrade. The lid has a rubber seal around the rim suggesting it may be for food use or even a tobacco jar. I get the feeling it dates to the 1960's although it could easily be older as it shows genuine age related wear to the underside. Rustic Studio Pottery Olive Coloured Olive Oil Jar with Pottery Stopper. Rustic Olive Coloured Olive Jar with Pottery Stopper, Mark on Base. Height 5.5",diameter at top 1.5" , at waist 2 .75", and at base 2". Photos taken under artificial light so colour may appear different from the actual item. Reasonable offers considered, if you find my Accept Offer limit is too high please contact me if you would like to haggle. B23. no465. Janet Leach 1918-1997 - Lidded Pot c1970s. Stoneware with white glaze. By Jane Hamlyn. Lovely hand potted jar with lid. Beautiful brown salt glaze. 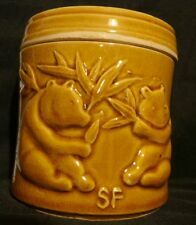 New listingVintage pottery lidded biscuit jar or Tea Caddy. Bamboo and Panda Bear Pattern. A small biscuit jar or Tea caddy. With a very attractive pattern of bamboo plants and Panda bears. Treacle brown glaze that has very slight crazing and a few dark flecks trapped in the glaze. I have shown these on the last 2 photos. Twin handled with GARLIC in raised lettering to one side. 4 perforations to each side. Lovely speckled effect glaze. "Bryan and Julie Newman set up their pottery in Dulwich, South London in 1961. They made earthenware and stoneware pots and Bryan specialized in sculptural pieces. Marks & Origin Sonia Lewis with seal mark and paper label. A stylish studio pottery stoneware lidded jar the bulbous shaped base with ribbing around around the body and decorated in dark brown and tenmoku like black glazes with a slightly textured or 'ashen' finish. Thomas Weir Howard Studio Pottery Blue Glazed Jar. Monogram and date near base. Lovely pot stands approx 14 cms including lid. Unusual item to find in such good condition. Monogram and date to bottom. Lid Missing. Lid missing. The jar is decorated with a brown wash applied with blue drip glazes. Despite the quality of this example it is not apparently marked. Item Condition Small glaze chip to the lid handle. Age 20th Century. The body is decorated with classical scenes. Maker: Wedgwood, England mark to underside. Goods are security marked to prevent fraudulent claims. The lid is a loose fitting example. Actual Images of item are shown above. Great form and Tenmoku glaze from Roger Cockram. Unknown age or origin. Overall height approx. ROY NEWMAN? PEAR TREE POTTERY STUNNING STUDIO LIDDED JAR POT 20TH C.
This is a beautiful studio pottery jar in reduced fired stoneware with superb glazes. There are some incised lines on the base which may be a mark, but I don't know who the maker is but it is a lovely thing. Size: about 4 inches (10 cm) high Weight: 513 grams Condition: Good - but this is a factory second - the lid has stuck to the base with a spot of run glaze during firing, and although the potter was able to successfully separate them without breaking it, there is a small chip to the inner rim as a result. See photographs. VINTAGE STUDIO POTTERY LIDDED MATT GLAZED JAR SIGNED ORLOV. MIKE DODD (born 1943); a stoneware jar and cover. This wood fired tsubo jar is signed near the base with the small bird and kiln mark of Robert Sanderson. "Robert Sanderson has been a woodfire potter since 1976. He co-wrote Wood-Fired Ceramics Contemporary Practices published by the University of Pennsylvania Press in 2000. GORGEOUS TEA COFFEE SUGAR STORAGE JARS. NO MAKERS MARK. POTERIE DE LA COLOMBE MATTE STUDIO POTTERY KITCHEN CONTAINER. A stylish kitchen container by Poterie de la Colombe. Reason for Sale. Rustic Studio Pottery Olive Colour Olive Oil Jar with Pottery Stopper. Rustic Olive Coloured Olive Jar with Fine Spout unknown Pottery no marks. In Excellent Used Condition No Chips Nibbles or Crazing. Two Fine Cracks on underside of spout, see last photo, sadly not much cop for pouring oil! Makes a good display piece? Height 7.25",diameter at top 2" , at waist 5.5", and at base 4". Photos taken under artificial light so colour may appear different. BC2 shelf 2. no 126.Reasonable offers considered. I WILL BE AWAY FROM 17APR 2019 TO 27APR 2019 SORRY FOR ANY INCONVENIENCE. Unmarked by classically Ray Finch decoration and identical to marked examples. Excellent condition. Stunning opportunity. Bryan Newman now around 83 has been one of this country's most outstanding potters for over half a century. He employed a wide range of decorative styles from sparse brushwork on a dolomite glaze to quite dense painted decoration more like textile designs. 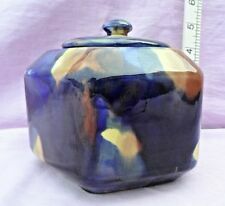 Vintage Art Pottery - Attractive Good Size Blue & White Lidded Storage Jar. Approx sizes :- 28cm tall x 12.5cm wide. Good display piece. Good clear pattern with strong colours. The jar vigorously hand-thrown in stoneware, with raised banding or 'strapping' running around the circumference. Applied handles to the side and a well-fashioned loop to the lid. The whole covered in a satin ash glaze, which has pooled to gloss highlights at the bands. Totally Stunning Square Round Green and Brown Drip Glazed Pot by unknown Pottery, no marks. Each Side is Different from Top or Bottom, quite Breathtakingly Lovely. In Perfect Condition No Chips Nibbles Cracks or Crazing. Height 6.25" , diameter at top 1. 75" , width 3.5",and diameter at base 2.75" . B15.Reasonable offers considered. A beautiful Skye pottery lightly ribbed preserve jar with lid. In good condition as seen in photos. Lovely item to display your jams or preserves. Or ideal gift. Vintage pottery lidded biscuit jar or Tea Caddy. Bamboo and Panda Bear Pattern.